Here is one trailable sailing boat whose most distinctive attraction is not its ability to sail. Instead it is its great ability as a fast power cruiser. That it sails well too and has a mass of clever features seems almost like a bonus. Unlike the vast majority of US imports, the MacGregor 26 with its 2.34m beam is also trailable without restrictions, and its trailing weight of 1400kg (plus motor) makes it an easy pull. Its accommodation is so spacious and well laid-out that it would make a very acceptable caravan. The idea of touring Australia with free accommodation and the ability to cruise anywhere there is enough water is very attractive. 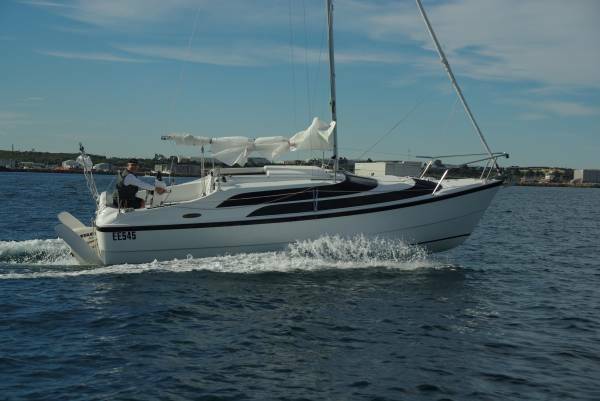 A price of $45,000, again plus outboard motor, is attractive too. The point of the plus-motor reservation is that the power range of this boat is from 5 to 60hp, or nothing at all of course. 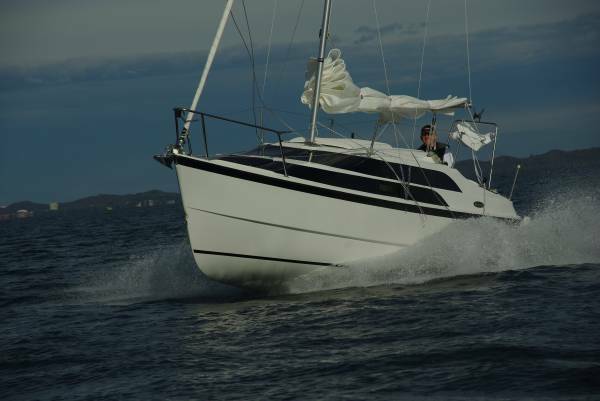 Five will give the sort of performance usually acceptable in an auxiliary, and 60 is good for 22 knots. For a long weekend at Rottnest you might decide to leave the mast at home and be a powerboat. Or when the wind fails you, you do not have to go home at idling speed. The trick to this is a hull shape suited to planing, coupled with low weight. To get the necessary weight in the right place for sailing, the MacGregor relies on water ballast, 520kg of it, to add to the 136kg of permanent ballast. The water is taken on by opening a transom valve, and drained either by getting over eight knots under power or when back on the trailer. The weight is of course entirely within the hull so the righting moment is not as great as a ballast keel would give, but seat of the pants on review day said stiffness was acceptable. 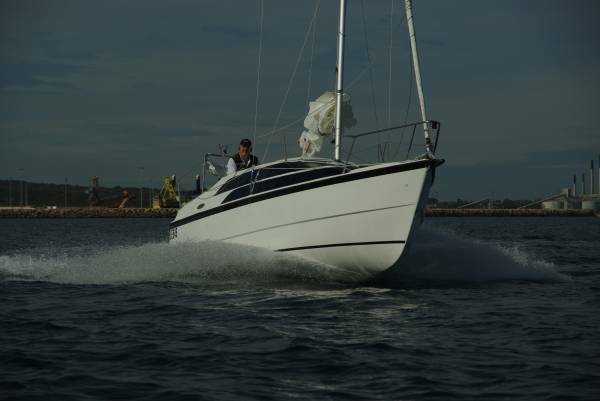 Keel area is given by a daggerboard that increases draught from 0.3m to 1.75m. Rigging proved to be a one-man job. A hand winch is provided for raising the mast, but there is so little weight involved it is not vital. Forestay and two pairs of shrouds, one on swept-back spreaders, support the mast without the help of a backstay. It is a rotating mast, giving better airflow to the mainsail. 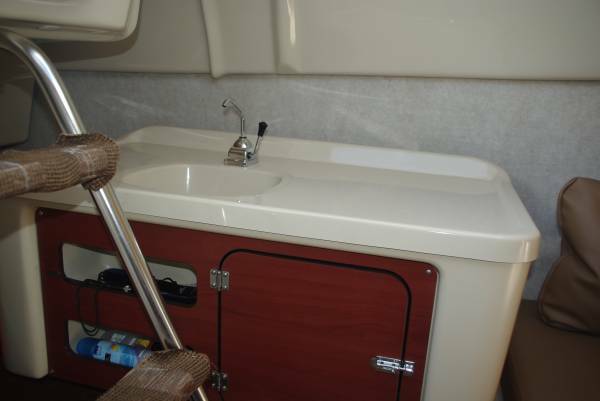 The sail area, main and genoa, is 37sqm, which is pretty effective on this light boat. We had only around 7 to10 knots of wind, yet saw a best boat speed of five knots. On the wind speed dropped of course, but the MacGregor showed itself to be closer winded than I expected. 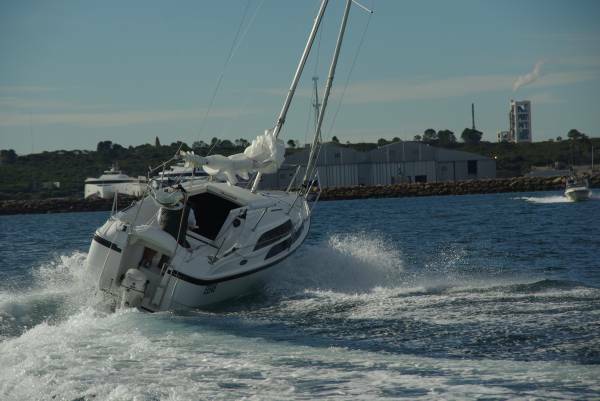 Steering is by wheel – inevitable when it needs to control both a pair of kick-up rudders and the motor. When sailing, the motor disconnects from the steering and locks amidships with a very quick and neat gadget. The wheel, mounted on a pedestal carrying the electronics, is powerboat sized but required very little effort in sailing mode. All the control lines lead back to the cockpit where a pair of winches is mounted. There is nothing complicated about the layout, and a converting power boatie would soon get the hang of things. There is no doubt that the big market for this boat lies more with him than with the traditional sailors. Below the boat seems huge. All but a few inches of its length is devoted to living space and, with the absence of side decks, the same applies to the beam. A toilet lives between two partial bulkheads, but otherwise it is all open space. A mirror covering most of one bulkhead makes the space visually larger. There are permanent double beds at each end and two part time singles amidships. At other times they are a dinette and a couch. An ingenious sliding galley moves to wherever is convenient at any moment. 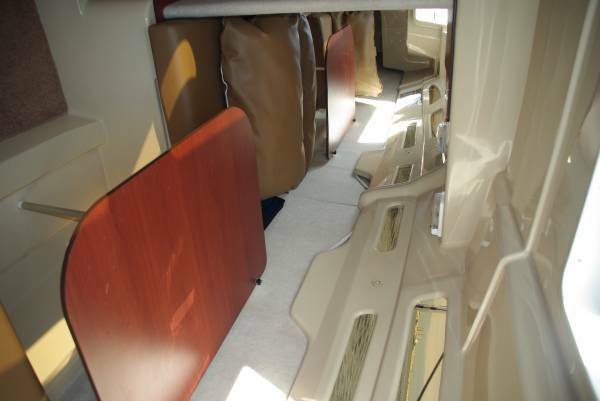 An icebox is below one of the dinette seats, and general storage under everything else that is not taken up by foam flotation. Moving around is unhampered, and requires no bending in the main part of the cabin. Up top is uncrowded too. The cockpit is big enough to seat half a dozen comfortably, and would even take a couple of al fresco sleepers. The lack of side decks is no handicap to movement: stanchions and guard wires protect the pathway over the cabin top. The foredeck has a substantial pulpit and good anchoring arrangements: the anchor is stowed powerboat fashion, and the lidded anchor well has capacity for plenty of cable. The fuel capacity of 90L in portable containers under the cockpit seats would give useful range purely as a powerboat, and practically limitless as a motor sailer. With extra fresh water containers on board, a week’s cruise for four could be contemplated – quite something for such a modestly priced boat.